The Office of Neighborhood Involvement is hosting an all-day series of workshops and discussions, called the “In It Together” Community Summit, on February 28th at the convention center. Managing Neighborhood Growth & Change: Strategies & Tools for Influencing Neighborhood Design and Facilitating Greater Community Input: Portland is experiencing unprecedented growth and development that is rapidly impacting the density, form and character of existing neighborhoods. As we grapple with how to accommodate new development into existing communities, many neighborhoods are using creative strategies and tools to influence the form and design of new development. Hear from Neighborhood Association representatives how they are creating their own residential and commercial design guidelines to articulate community design priorities and preferences for new development. Join us to learn about these tools and other creative strategies you can use to facilitate greater input and community involvement in shaping your neighborhood. Emma’s Garden Seeks Market Farmers!!! Emma’s Garden is seeking Farmers for its Market Farm Program. Full details HERE. Emma’s Garden is a nonprofit organization that creates sustainable local economies within neighborhoods. Their market garden program offers a hand up to those who are ready to learn new skills around building a market garden business and improve community connection and access to local healthy food. For further questions, or to apply to be a farmer, visit emmasgarden.org or contact liz@emmasgarden.org or at 630-251-4458. 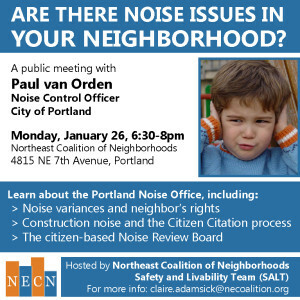 On Monday, January 26 from 6:30 – 8:00 p.m., the NECN Safety & Livability Team Meeting will feature a presentation by our City Noise Control Officer and NE resident Paul van Orden, who will be coming to discuss the City’s Noise Program and to answer your questions and concerns about noise issues. There will be no CNA Board meeting on Tuesday, December 9th 2014. Enjoy the holidays and please look for us back on our schedule every 2nd Tuesday starting in January. CNA Holiday Party – Tuesday, Dec 2nd! All Concordia Neighborhood Residents & Businesses are welcome to the Free Festivities! Come Mix & Mingle with Neighbors & Friends! Raffle Ticket purchases will benefit Hacienda CDC, a Latino Community organization that provides affordable housing, homeownership support, economic advancement and educational opportunities. Every year in November, CNA invites nominations and holds elections for a number of board positions. If you or someone you know would like to contribute your skills, interests and enthusiasm to bettering the lives of you and your neighbors, this is the chance to get involved. Whether your interests are in land use policy, social events, arts, nonprofit management or a host of other areas, there is no better time and no better way to step forward and join with your neighbors to help preserve and build the Concordia we want. The update below represents just the current roster of candidates but nominations are being accepted all the way up to the election night so the list will certainly change. We’ll try to update it here. Yes, you CAN nominate yourself! You simply need to be a Concordia resident or represent a business or organization operating in Concordia. #7 – Tracy Braden – Tracy has served on the CNA Board for the last year as Secretary. She has been a resident of Concordia since 2003. She is an academic advisor at Portland State University and holds a master’s degree in Counseling. She loves the neighborhood and thinks that Portland is the best place on earth. She’s happy to continue serving in her current role. NOMINATIONS ARE STILL OPEN!!!!! If you would like to be put on the election ballot or have any questions contact Bob Martinek, Chairperson of the Nominating Committee at bmartinek@cuportland. edu or pastorbob60@comcast.net or call him at 503-724-5596. Nominations will be TAKEN FROM THE FLOOR the day of the election on Nov 18th. Pasted below is the DRAFT agenda for the October 14th meeting of the board of directors of Concordia Neighborhood Association. Public attendance is welcomed and encouraged. If you haven’t heard already, the October 7th general meeting of Concordia Neighborhood Association will feature a presentation and discussion on the growing issues surrounding residential demolition and construction trends in Concordia and throughout the city. We know this is a very hot topic for many people and for a variety of reasons so we’re looking forward to a lively conversation.